Lit and Scribbles with Jae – Join Jae on the ongoing journey to better writing. 2. I finished a major rewrite of a YA Thriller that takes place in Tokyo. My writer’s group’s frequent feedback was it wasn’t following enough of a thriller track and after some hard looks I had to agree with them. So I pondered and pondered for months. Part of my process is basic outlining, because then I know where the paths lead and if that’s the path I want to take or not. I feel like it’s a combo between plotting and pantsing. It didn’t turn out exactly the way I had thought, which was fun. And I ended up creating a new character because of it, but I think it made sense. Plus I seem to have a habit of creating characters and then not really using them, but in this draft I brought an underutilized character to the forefront. I understand the appeal in imagining you can get it right the first time, but when you realize that writing is a journey and rewrites are going to happen if you want a good story, you sit back, relax, and enjoy the ride. Well, okay, most of it. There are those moments where you want to pull your hair out because the rewrite still needs some tweaks. But overall, worthwhile. 3. Finished a short article for a magazine. Another writer friend of mine said she thought it was the best thing I’d ever written. I’m going to submit it to the magazine this week and see what happens. Fingers crossed. And of course I’ll keep you updated. 4. The hubs and I are trying something called My Miracle Tea which is supposed to be like a major detoxifier. What does that mean? You get to poop, a lot. But it’s supposed to help with your liver and kidneys which, if too junked up, may contribute to stomach weight gain. We both feel like our stomachs could use a little extra help. I’ll let you know more about that as we go along. Why did I even get on this tea in the first place? 5. Foot zoning! It sounds like witch doctoring, but I feel like it’s legit. What is it? Someone gives you what is likely the most painful foot massage of your life and is able to tell you what’s going on in your body. I might still be skeptical of that much, except she knew stuff I hadn’t even mentioned. But to add to that, I also went to see a hormone specialist and they pointed out and recommended the same things. Now granted, I’ve only been one time, so I can’t attest to the validity of all of it. But the friend who recommended me has personal stories of migraines going away after drinking teas this lady recommended, as well as discovering the lactose intolerance of a kid that doctors hadn’t pointed to. You can still skeptic away if you want, but I’m keeping an open mind after hearing and experiencing all of that. Besides, I’m more of the homeopathic mind when it comes to health these days. That is NOT to say I think all pharma is bad. Some people really do need the medications they are on. Are we overprescribed in general? I think so. But does that mean all pharma is bad. Nope. And that about covers it. I’m letting the rewrite of item 2 get cold before editing it. So in the meantime I’m kicking around another idea. I don’t know if you’d call it urban fantasy. Or steampunk futuristic, but it’s more of a middle grade story. And it’s weird. But I’m really liking it. Okay, that’s what’s up with me? What’s up with you? Hello blog world! As it turns out I wasn’t face down in a ditch. Or dragged into the sewers with IT. Or blew a secret ninja mission and ended up in North Korean prison. Yeah, glad I’m not there. No folks, I’m alive and kicking. But it has been a busy (glances at the last post entry date) uh, yikes, three years. Really?! Three years? Sheesh. Okay, so yeah, a lot going on. Welp, a lot, actually. Let’s see, 2015. Wasn’t the best of years. But it did end on a higher note. My sweet mom was diagnosed with early onset Alzheimer’s in 2010. The decline was steady, but tolerable. But from about Christmas 2014 to June 2015 things really took a nosedive into bad. I know there are a lot of strong feelings about this subject, but after she grew really bad we decided to put her in a care facility. I used to judge people who seemingly “dumped” relatives into facilities, but now I definitely don’t. It’s a painful decision, but often it can be the right one. My dad, as the caretaker, was looking worse and worse and his health instantly improved once we moved her. Plus, she didn’t look at him as the warden, but as her husband again. If you have ever lost someone very important to you, then you already know how it feels; and if you haven’t, you cannot possibly imagine it. How true that is. I’d lost friends and grandparents, but never someone seemingly before their time who was that close to me. The only thing that kept me going, and keeps me going, is knowing she’s not suffering. Do I wish she was still here? Absolutely! But would I bring her back in that state? Absolutely not. I can’t say after three years that it doesn’t still hurt, but it does get a little easier to bear. Along with this I had a cyst I wasn’t sure whether it was cancerous (it wasn’t, thankfully), lost my job, and endured several months of unemployment. BUT! My Dad and I were going to be the only ones around for Christmas and rather than sit at home missing my mom, we thought we’d do something amazing. We headed out to New York City. I’d been several times before. My dad went once when he was 18, but that was a looooong time ago, so some of the city felt new to him. And we had a blast. Plus the weather was unusually warm, so we didn’t have to trudge through the infamous New York slush. Rockefeller Plaza was PACKED! But worth it. I haven’t yet stated my Row80 goals, so here they be, whether overly ambitious or not, I’m still gonna give it a go. Outline the rest of Codename Clemmings. I need to turn this novelette into a novel. I think it has great potential, but originally I only saw it as a novelette, so it’s been doing nothing after 5 chapters. I’ve had some vague ideas, but I haven’t really put in the effort. Time to make it so. Finish “The Fire in Fiction” and read two fiction books. I don’t know why TFIF just wasn’t happening for me, but that’s what another Row80 is for. I also have a few unread books on my Kindle for the fiction option I should be able to cram in. Last time I got three fiction books in with a goal of one, so certainly I can make two. Write Codename Clemmings. I want to get a first draft off. Preferably a semi-edited draft, but a full draft in some form. I think this is possible considering I’ve already got the first 5 chapters and this is a YA. Do writing exercises at least once a week. I got a few writing exercises from a forum at a conference and I believe they’ve already strengthened my writing with what little I’ve used them. I want every story I write to be even better than the last one and I want my skill to continuously improve. I never want to become one of those writers that gets lazy just because they’ve made it. I want my readers to keep coming back because they know I’m putting in my best efforts for them and for it to show. That takes practice. So writing exercises. Once a week. Yep. #2 Plot out a screenplay. This is really shooting for the moon here, but just a plot session might be possible. I did major in film in school and this short series project keeps coming to my mind. Plus I have friends in the independent biz and if it turns out clever I might be able to get them interested. But can’t do any of that without getting the idea out first, right? Okay, go ambition, go! Still, remembering what I accomplished last session I think many of these things are possible. How are you coming on your goals already? Or have you also just started with new ones? I’d like to thank the WordPress.com stats helper monkeys who prepared a 2014 annual report for this Lit & Scribbles. Here’s to an even better year in 2015! At my writers group party, the spudnuts were a big hit. But I must say, having tried them both ways, they are much better fresh out of the fryer. And speaking of Christmas type events, last Sunday I attended one of Salt Lake’s biggest yearly events. It’s the hottest ticket in town, and it’s free—the trouble is can you get tickets. Often if you live out of town it’s easier, but as a local it’s anyone’s guess. What is this event? Why it’s the annual Christmas concert put on by the Mormon Tabernacle Choir and whatever guests they host that year. It’s usually a musically talented guest and someone brought as a narrating type. This year I knew I had to attend because who could miss out on seeing this? Yep. 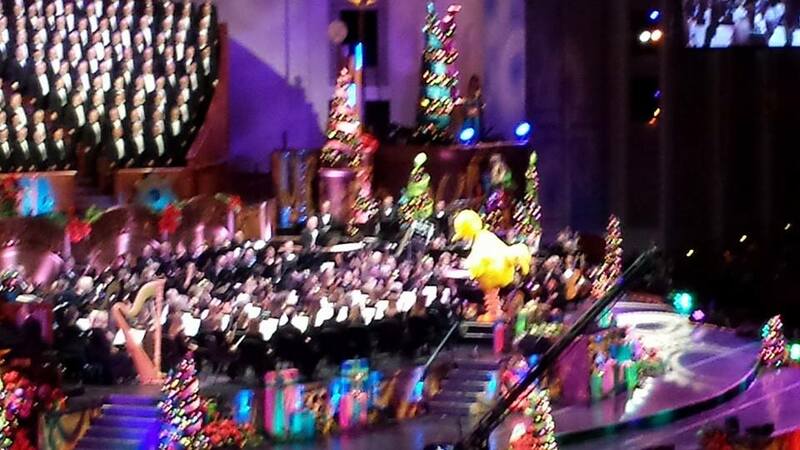 That’s Big Bird conducting the orchestra and choir. Big Bird! This year’s guests were Santino Fontana (of Frozen fame) and the Sesame Street Muppets. Usually the age limit for this is 8 yrs old and up, but this year they dropped it to 5 and the kids giggled with delight whenever the Muppets were out. It was probably one of their best shows I’d seen yet. It will be broadcast on PBS, but not until next year. However at the bottom of my post, I’ll embed a highlights video. Finish outlining Book 2. ACCOMPLISHED. Read “The Fire in Fiction” and one fiction book. Progress! I did read a little more The Fire in Fiction, but I also read The Great Divorce by C.S. Lewis. Where did that randomly come from? Well, I was watching Scrooge, the Albert Finney version and something in that reminded me of what someone had told me about The Great Divorce. Since it’s a pretty short read (about 100 pages in the version I have) I polished it off in a few hours. Fantastic little read if you’re interested in Christian theology. Not to say it’s authoritative or anything, just something intellectual to consider. So now that I’ve gotten three fiction books read I really, really need to make better progress on TFIF. Hopefully next week I will have finished it, or nearly finished. I believe next week is the last week for this session of Row80. Rework Book 2. ACCOMPLISHED. I sent off the first chapter to my writers group. As always, they had some good suggestions. It’s interesting how we writers tend to be fairly myopic about our own work, but can see easily see the holes in someone else’s work. That’s why it’s good to have a group to go to or some beta readers you can count on. BONUS GOALS: # 1 Write at least one short story. No new progress. #2 Do further plotting for Codename Clemmings. No new progress. I’m not sure if I’ll do the other project or continue working on this or polish up the first chapter of Book 2 more. I guess it’s good a new session of Row80 is coming up so I can make new goals to be accomplished. I’m still glad with the progress I’ve made overall. Now that we’re in the home stretch of Row80, will you get all your goals accomplished? Have you found feedback to be invaluable to improving your writing? And as promised, more Muppets. I have an upcoming writers group party and thought I’d test out making spudnuts before the actual event. What are spudnuts you asked? Well, having grown up Idahoan and still strongly claiming those roots, spudnuts are potato-infused donuts. 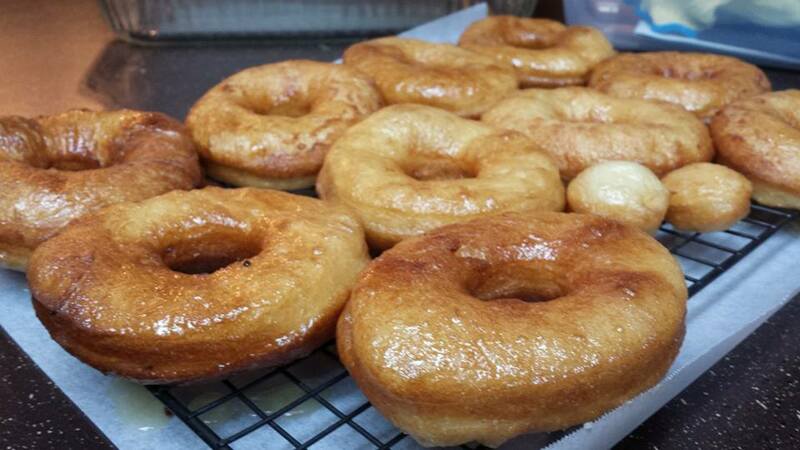 Yep, there be potatoes in them thar donuts. But no, it’s not like bumping into french fries while eating a donut. If you’ve had potato rolls before, you get the idea. It just makes them that much more delicious. And for an Idahoan, yet another useful recipe involving our state’s beloved product. Speaking of upcoming writers group party, Ms NYT BS has hinted to be there. She wasn’t at the last writers group meeting so we’ll see if anymore of the drama unfolds then. Seems like a Christmas party would be the time for it to happen. We’ll see. Now that you’re sufficiently hungry, how about that Row80? It seems to be coming along nicely. Read “The Fire in Fiction” and one fiction book. Progress! Still have not read much more of The Fire in Fiction but I am working on What Happened to Goodbye and one other fiction. The other fiction, which shall remain nameless, I’m not sure I’ll get through. It’s sort of an obligatory read and it’s definitely not my type of book. Think academic literary fiction. (No disses on those who like this kind of fiction, I’m just not into it—hence YA fiction writer). The previous, WHTG, has more a literary feel to it, too. To be honest, I had no idea what the book was going to be about going into it. I just read your blogs and when you recommend books that sound interesting, I throw the name onto a list. And then months later that book ends up on my Kindle because THE LIST. I mention this though *because* despite not really being sure what in the world the book would be about, it grabbed my attention in the beginning and kept me captive until I was invested enough in the story to continue on my own. It’s not the bestest book in the whole entire world, but it’s interesting. I think it’s pretty good writing to hold the interest of a random reader like me who didn’t even get a blurb (or at least remembered one). Rework Book 2. ACCOMPLISHED. I doubt it is by any means perfect, but I finally finished this round of reworkings. I feel like it’s at a place where it can be read by beta readers without it being wasteful. Now I just have to wait on beta readers for changes, but I think it’s just fine if it takes a while. I need a break from the world I think. Well, truth be told I’d love to jump into Book 3, but a wise friend of mine said a genre switch, even if just a short story is supremely helpful to the writing. After I got SHADE to its pitching glory I took a break and wrote Codename Clemmings (as far as I had plotted anyway). It was amazing what a difference I felt. And then when I went back to the SHADE world, I felt refreshed. Which means Bonus Goals get to happen somewhat. #2 Do further plotting for Codename Clemmings. Progress! Hooray for bonus goals happening. I’m not 100% sure about the plot of this, but it’s coming along either way. It’s odd how if you spend so much time in one part of the process, say revising, the other parts seem a little foreign in the beginning. Okay, so hooray for bonus goals happening. Isn’t it nice when little surprises happen like this? Although I don’t know that I’ll get to the short story writing, but one can never tell apparently. What would you say to Ms NYT BS if you ran into her? Do you take a break from your genre once finishing a major project or do you plow into the next one? Have you ever had to read a book out of obligation? Were you able to do it? One thing I would definitely recommend putting on your bucket list is a flight over Monument Valley down at the Utah/Arizona border. The company I did it with is out of Page, AZ. 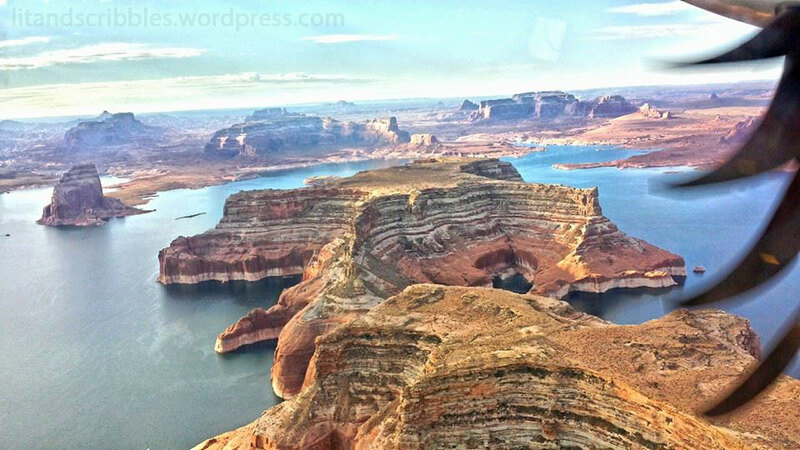 They fly over Lake Powell first (pictured above) and then take you on to Monument Valley. Worth every penny. And as you can see, you can get some pretty spectacular photos up there. This I took with a Samsung S4 (a camera phone). And now onto Row80. What did I accomplish this week? Read “The Fire in Fiction” and one fiction book. Progress! I have not read much more of The Fire in Fiction but I did finish Supernaturally, book two in the Paranormalcy series. It’s an easy YA read, very much aimed at teen girls, but still a lot of fun. A lot of the book is connected with faeries, and these particular ones are a lot like those found in Patrick Rothfuss fantasy books. It’s definitely piqued my interest. Perhaps one day I’ll write a story about these kinds of faeries as well. Rework Book 2. Progress. Getting there. Getting there. I have 28-ish chapters and I’m to 18 with revisions. Although I think I could probably combine a couple of chapters. I think most of these are pretty short (like 6 pages). Anyways, been weaving in some new stuff that’s made the book a whole lot more interesting. Once I get it to a place I’m mostly satisfied with, off to beta readers with it. #2 Do further plotting for Codename Clemmings. No new progress. Not sure the bonus goals are going to happen. But I always feel like setting goals and falling short is better than floundering around. I will definitely need a break from the SHADE world once Book 2 is finished. I’d really like to attend another writers conference in 2015 as well. It’s been hard to plan for anything lately, but I may just sign up anyway. (They issue refunds). I like the energy and comradery that comes in being around other writers. Plus I’m always interested in getting feedback on my stuff. And there is always valuable information to be gained from forums. Do you attend writers conferences? If not, why not? What do you find to be the most helpful to you in attending writers conferences? And how are your own personal goals coming?